“SJC Fountain with 4 Bells” painting by artist Jackie Jacobson is transformed into a beautiful ceramic tile art coasters. 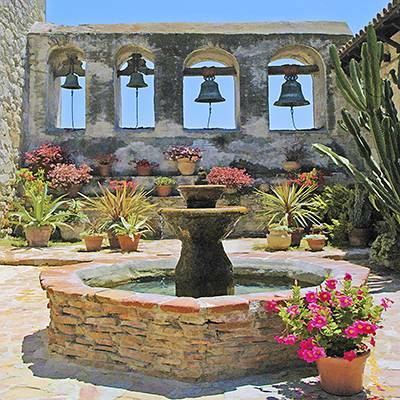 Mission San Juan Capistrano “Fountain with 4 bells “ is from the mission series of paintings and now a coaster by artist Jackie Jacobson. It is also where the swallows return every year. Jacobson said, ” I have visited many California missions. My favorite is Mission San Juan Capistrano. Tile art for home or office. Previous post: Were You Born With Talent? Next post: What was Your Favorite Color Year?